We are ready to be recognized as one of the best liberal arts colleges of the 21st century. This is how we will get there. The collective generosity of alumni and friends has enabled Lycoming College to make meaningful investments in our students, the academic program, and our physical campus with gifts and commitments totaling over $60 million toward our $65 million goal. Now in the final year of our comprehensive Campaign for a Greater Lycoming, we have much to celebrate, but there is still more to do. We aim to go above and beyond our initial goal of $65 million by seeking an additional $5 million in support of our four priorities outlined below between now and June 30, 2019. We invite you to step forward in this final year to make Lycoming even Greater! We have the opportunity to build on our liberal arts legacy and revolutionize the way we put this enduring education to work for our students. Our steadfast commitment to the liberal arts and sciences is integral to the success of our students and keeps Lycoming relevant. There’s no need to change that model; only make it stronger. By emphasizing a modern interdisciplinary approach to education, we can both bolster our academic offerings and enrich the experience our students have at Lycoming. We have already expanded the Clean Water Institute, established an astrophysics major, added a Latin American concentration to our signature archaeology program, founded an Outdoor leadership and Education program, and received a Mellon Foundation grant for undergraduate research. We still need your help to raise an additional $1 million in support, which includes a new academic program in data science and analytics. Modern financial aid goes beyond tuition and impacts high-need as well as middle-class families. Our financial aid budget has grown by more than $8 million during the past five years — a 29% increase. We want to make sure a Lycoming education remains accessible to new generations of smart, ambitious young people regardless of their circumstances and their capacity to pay. New endowed scholarships will enable us to create opportunity for future Warriors. 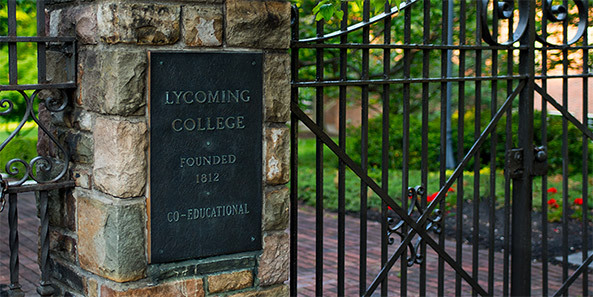 Despite what is a challenging time for higher education, this is an ideal moment for Lycoming. We are well-positioned to attract and recruit the best and brightest young people. Help us reach our goal of an additional $2.5 million to support young scholars by donating to an endowed scholarship. In recent years, Williamsport has been ranked the sixth-fastest growing small-city economy in the country — a renaissance Lycoming is poised to leverage. We can become one of the great liberal arts colleges of the 21st century, but our campus must reflect that greatness. This campaign envisions the development of a new south-facing campus Gateway — a new facility for admissions, the Center for Enhanced Academic Experiences, and the Outdoor Leadership and Education Program — positioning the College for success for decades to come. We have already built the Lynn Science Center, renovated Asbury, Crever, Rich, Skeath, and Wesley residence halls, and opened the Lycoming College Art Gallery in downtown Williamsport. But there's still more to do by securing an additional $1.25 million, part of which will enable the College to create a maker’s space and biochemistry laboratories. The college world is a very fast-moving and competitive landscape. The Lycoming Fund's purpose is not to keep the lights on, but rather to power the best of Lycoming when we need it, especially for enhanced scholarships to compete for students and immediate funding for undergraduate research and global experience. Help us rise to the challenge and meet our additional goal of $250,000. Make a gift.